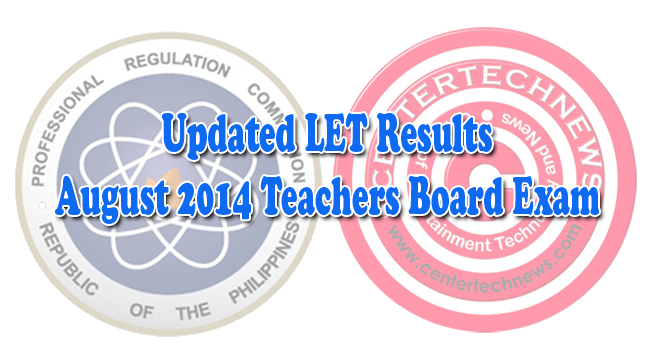 Updates on LET Results of August 2014 Teachers Board Exam: Professional Regulatory Commission and Board of Professional Teachers release the much anticipated list of passers in Licensure Examination for Teachers both in Elementary and Secondary Level. LET is given twice a year and the results are always released not later than 40 days, but this year the result came out after 51 working days. As announced by PRC, out of 70,786 examinees, 25,301 elementary teachers(35.74%) had passed while 26,767 secondary teachers out of 77,803 examinees (34.40%) successfully passed the Licensure Examination for Teachers (L.E.T.) given on August 17, 2014 in Hong Kong and 24 testing centers all over the Philippines. As announced, the 25,301 elementary teacher passers are the combined numbers of 21,649 first timers and 3,652 repeaters. For the secondary teachers, 23,820 passers are first timers while there are 2,947 repeaters. Those aspiring to be teachers are required by Republic Act 736 to take LET and pass an average not lower than 75% and no rating of less than 50% in any sub-part of the test. Elementary Level has a two part test while Secondary Level has a three part tests, both are taken in a day. PRC had earlier given a heads up for those waiting for the list that they would update theirIT Systems on September 14, Sunday to give better service especially that the speculated release of the passers’ list was expected to be released at any time, only few expected that it would actually take 51 days before the list to come out. The results of the Licensure Examination for Teachers both in Elementary Level and Secondary Level, as well as the Top 10 is posted on the PRC official website and here on this site to help you navigate through the list. Keep yourself updated about LET Results of August 2014 Teachers Board Exam by following us on Facebook and Twitter.